I am frequently asked by other Hi Power fans, “What is your personal carry Hi Power?” Variations on this theme often include, “What modifications have you made?” Finally, ammunition choice is requested. First, let me assure you that I do not claim to know all things and would not presume to try and “tell” anyone what is “right.” This can vary with the individual and their personal needs, be they real or perceived. Next, I prefer a trigger pull that’s neither below about 4 1/2-lbs nor more than a pound more. Speaking only for myself, I find no difference in group size nor the ability to make quicker (accurate) shots with either if the trigger breaks cleanly. Unfortunately, many Hi Powers come with triggers that are considerably heavier and gritty, a sad and needless situation in my opinion. It is my observation that most detractors of the Hi Power address both the trigger pull (out of the box) as well as hammer bite. A competent pistolsmith or trigger specialist who understands and is familiar with the Hi Power design can correct the trigger pull and very serviceable trigger pulls can be had with or without the magazine disconnect in place. 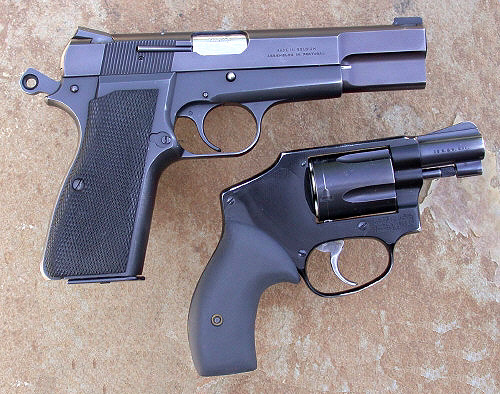 The Hi Power that I carry the most is a Mk III 9mm that I bought used. I believe that the magazine disconnect may have already been removed…which save me from doing it. The gun had not been shot very much and the bluing on the breech face was barely scuffed. The gun locked up tight and while it had a small ding or two, it was overall sound and the price was very right. 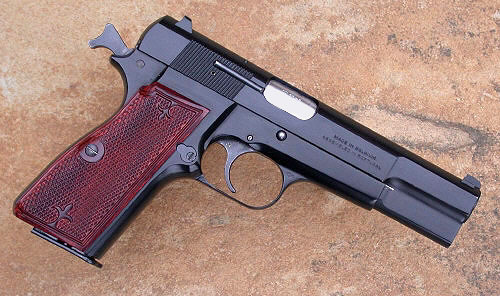 This is the 9mm Hi Power I am most apt to carry for self-protection. Here are the changes that have been made: The hammer spur was bobbed and reshaped at home. The factory trigger is in the gun. The right-side factory extended thumb safety was removed and the shaft reshaped. There is no magazine disconnect in this pistol and the trigger was good when I got the gun, right at 5-lbs. I have a Wolff conventional 18.5-lb recoil spring in this gun and it works just fine with standard pressure rounds as well as +P. The barrel is stock and the mainspring was left at 32-lbs. The finish is the factory “matte” and the grips are from Altamont. This pistol has proven itself reliable with every conventional JHP I’ve tried that weighed 100 to 147-gr. This Hi Power is no different than many, many others in the hands of Hi Power fans and I’ve been pleased with the “wearability” of the factory matte finish. The Altamont stocks didn’t seem comfortable to me at first, but sort of “grew” to fit my hand and I like them on this pistol. FWIW…if anything, I also have an extreme fondness for grips from both Craig Spegel and Hakan Pek. My primary carry Hi Power uses the factory fixed Mk III sights. They are dead bang “on” for me with this gun and I’ve found no good reason to change them. A couple of my Mk III pistols have had Novak fixed sights installed. They are elegant sights to be sure and offer a good sight picture for my eye, but I find no advantage to them over the factory sights in group size, be they fired slow and precisely or at speed. This may or may not hold true for others and is one more decision that is best made by the individual user. Some folks have asked why I routinely remove the right-side ambidextrous thumb safety lever. The reason is that it gets in my way. With my hand and my grip on the pistol, I have accidentally engaged the ambidextrous thumb safety and have decades of practice in reaching around the rear of the gun with my off-hand thumb and engaging the left-side lever. (When I first started shooting Hi Powers and 1911’s, ambidextrous safeties were practically non-existent.) They just don’t work for me; they might work fine for you. I use only Mec-Gar magazines for serious purposes be they sold under Mec-Gar’s name or as Browning “factory” magazines. I have found none better in the long run. Though I own and have had no problem with the Mec-Gar 15-shot 9mm magazines, I usually just use the standard 13-shot version. I have less money in this Hi Power than any of the others and were I to use it in a legal shooting, I am well aware that it will be gone into the evidence locker at least until I am no-billed by the grand jury. I can tolerate this easier than I could were it another having more financial or sentimental worth to me. I hope that the preceding has been of use and that no one is disappointed in the sort of “vanilla” Hi Powers I find to work well for me. If you are new to Hi Powers or are considering using one for protection, I respectfully submit shooting the gun quite a bit before deciding what changes might be in order. Please keep in mind that what “works” for me might or might not be the best choice(s) for you. This entry was posted on April 28, 2008 at 7:59 pm	and is filed under Contributed Gun Reviews, Hi Powers. Tagged: Add new tag, Browning Hi Power, Carry Hi Power, Hi Power, Stephen Camp. You can follow any responses to this entry through the RSS 2.0 feed. You can leave a response, or trackback from your own site.